"The traditional Haveli in the historic location of Mandawa in Rajasthan now exists as a popular heritage hotel in Rajasthan. With state-of the-art facilities and special features like village safari which introduces one with the splendor and luxurious history of the village, Paawana Haveli is the first pick of accommodation for discerning travelers to Mandawa. Mandawa city was established in the 18th century. The rich merchants of Rajasthan resided in the area at the time. It was during that era when Paavana Haveli was built by them as their residence. It was one of the numerous magnificent havelis that the rich merchants constructed with stunning frescoes in 18th century before they moved to the cities for their business ventures and Paavana Haveli became a major tourist attraction. Now it exists as a comfortable heritage hotel. 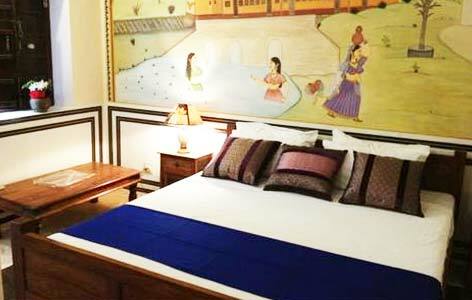 Standard Room: The basic rooms in the hotel furnished with period furnishings. Superior Room: These rooms are much more spacious than the standard rooms. Deluxe Room:These rooms are the best accommodation in the hotel with fresh and modern surprise touches. The hotel houses an on-site multi-cuisine restaurant, Nana, is known among guests for its amazing Indian, Rajasthani and European cuisines. The hotel is located on the rooftop and hence amazing views of the vibrant town of Mandawa can be seen from here while enjoying the delicious meals. Mandawai city which is situated in the popular Jhunjhunu district of Rajasthan, ahs over the years, earned a special place among tourists because of the numerous palaces, forts and havelies in the city. The city was established by Bhojraj Ji Kasubsub in the 18th century and it truly reflects the true essence of rich cultural heritage of the desert state of India.